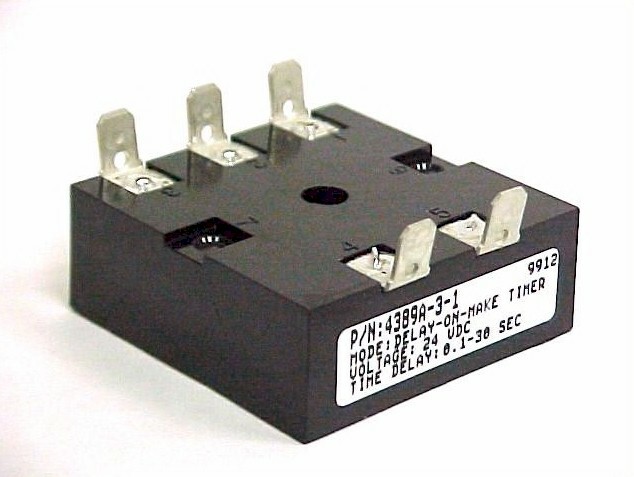 The model 4389 is a delay-on-make timer with the output contacts normally open. When operating voltage is applied to a load connected to the model 4389 the load circuit will remain Off. The load circuit will remain Off until an initiate switch closes and a preset timing period expires. At the end of the preset timing period the output contact close and the load circuit is turned On. When the initiate switch is opened, the output contacts open and the load circuit is turned back Off. Operating Voltage 5, 12, 24, 48 DC or 12, 24, 48, 115, 230V AC 50 / 60 Hz for AC Voltages. Output ULCSA contact rating 13HP, 125, 250V AC 10 A 125, 250V AC, 10 Amperes 30V DC. Timing Mode Delay On Make - Normally Open. Timing Range Fixed times from 0.1-8000 seconds. Adjustable timing ranges from .1-8,000 seconds. See timing chart below.